Thierry Baudet, political leader of the right wing political party Forum voor Democratie/Forum for Democracy. Our era is characterized by a toxic mixture of a changing climate, rising populist parties, an eco-unfriendly economic system, and irresolution on the part of the mainstream political parties. The recent Provinciale Staten elections and the division within parliament regarding how to meet the Paris Accords are concrete manifestations of this mixture in the Netherlands. These are, however, nothing more than local expressions of global trends. It is, therefore, more important than ever that we, as Global Young Greens, remain united and committed to our cause, in order to oppose the current trend. CO2-reduction will generate? The company or the consumer? And what about the side effects? In the time spent on debating, thinking, and compromising, global warming, and environmental degradation do not stop. Is it that many people, politicians included, do not see this, or is the truth so inconvenient, that it is simply easier to deny? As stated earlier, what is currently happening in the Netherlands are just symptoms of systematic problems. The Paris Agreement itself can be questioned in many ways: it provides participants with considerable leeway to decide the extent up to which they wish to contribute and it’s doubtful whether the agreed-upon goals will be sufficient to truly oppose climate change. Then, there is the rise of populism. Although this does not hold generally, there is a clear tendency among populist leaders to either doubt the gravity of the problem or, even worse, to deny its existence at all. 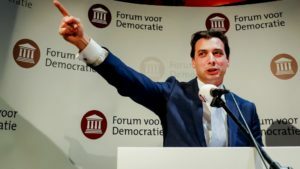 Prominent politicians as Trump, Bolsonaro, and Farage all belong to the latter group, just as newcomer Thierry Baudet of the Forum voor Democratie. Lastly, our contemporary economic system, premised upon low costs, high profits, and fossil fuels is a major obstacle towards true environmental progress. It is correct that many companies are big polluters and that a flat CO2-tax, as proposed by the left, could incentivize them to invest in more sustainable methods of production. However, caution is justified: companies could also decide to simply leave the country, at the cost of job opportunities and innovation. A European tax already exists. What is wise? It seems as if only changes on the systematic level could truly lead to a greener economy. All things considered, this might leave you somewhat discouraged. Companies do not yet have a clear incentive to become greener. The political domain seems slow and indecisive, and climate skepticism is gaining momentum. For all that, we, as Global Young Greens, cannot lose hope. These developments imply that more and more responsibility will rest on the shoulders of civil society actors as GYG. We should acknowledge this responsibility and stand up, precisely in times like these. Apathy or pessimism would only further benefit parties as the Forum voor Democratie, which would be in no one’s interest.